Bone needles represent an important Paleolithic innovation that made a sewing technology and tailor-made hide and leather clothing possible, designed to cope with harsh environments. 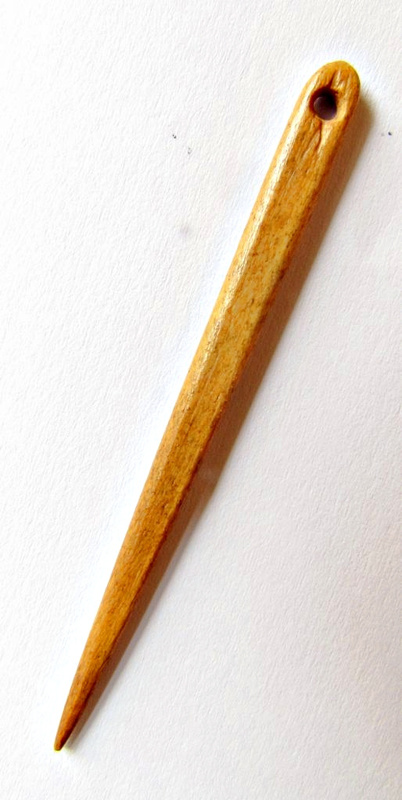 It is not by chance that many of these needles date to the LGM The example, shown here, is a Magdalenian Bone Needle from the Rochereil site in the Dordogne. At this site, several strata of a late and very late Magdalenian were found with an overwhelming production of bone-tools, figurative art and abstract decoration. The Magdalenian strata were followed by an early Azilian (Bipointe-phase). The needle shown here, exhibits the distinctive micro-wear pattern which is produced when such an artifact is used as a sewing needle, already shown decennia ago in the classic monograph: Danielle Stordeur: Les Aiguilles à chas du paléolithique (13e supplément à Gallia préhistoire;1979). Specialized bone technology first appears in the MSA of Africa and became widespread in Western Eurasia after 40 k.a. Cal BP. Standardized bone tools were not only produced by H. sapiens, but also by late Neanderthals (Lissoirs from several MTA sites in S/W-France). Eyed bone needles, another group of highly formalized bone tools may also be considerable old. Currently it is claimed that the the earliest eyed bone needle found so far dates to ca 50 k.a. BP. It was found in Denisova Cave and was probably produced by the Denisovans and not by H. sapiens. Anyhow, without direct dating of the Denisova artifact and more information about the site formation process, the suggestion that "The Upper Paleolithic settlement of Eastern Europe and Siberia may be described as the eyed-needle zone, because it contains the earliest known eyed needles" remains purely speculative. Many open questions too, remain on eyed needles reported from Kostenki 15 (35-30 k.a. BP), from Tolbaga (southeast of Lake Baikal) in deposits dated to 35 to 28 k.a. and eyed needles reported from Mezmaiskaya in the EUP (“Ahmarian like”) layers 1A and 1B, which are said to be at least 33-36 k.a old. In all these cases we are missing adequate publications and even high quality pics, to get an idea about we are talking about... That such findings can be published with a high scientific standard was recently shown by a joint group of Harvard and Chinese researchers. They published an eyed bone needle fragment from the Shizitan 29 site, Shanxi Province, dated to ca. 23-26 k.a. Cal BP. In China, where the systematic evaluation of the Paleolithic just has started, Upper Paleolithic examples of bone eyed needles were already published from the Shuidonggou Locality 2 (ca 30 k.a.) Cal k.a. BP, from the Upper Zhoukoudian Cave dated to 36-28 Cal k.a. BP. BP and at the Xiaogushan Site dated between 30-20 k.a. Cal BP. In Europe, after 150 yrs of intensive research, beside some isolated examples from the "Aurignacian III" at La Ferrassie, the earliest eyed needles come from the LGM and were found in larger quantities in late Solutrean layers (Badegoule, Laugerie-Haute- Est, Jean Blancs, Isturitz) and some Epigravettian sites of Central / South Europe.